In this BOM, the Bear Family Album features the entire bear family and what they like to do best. 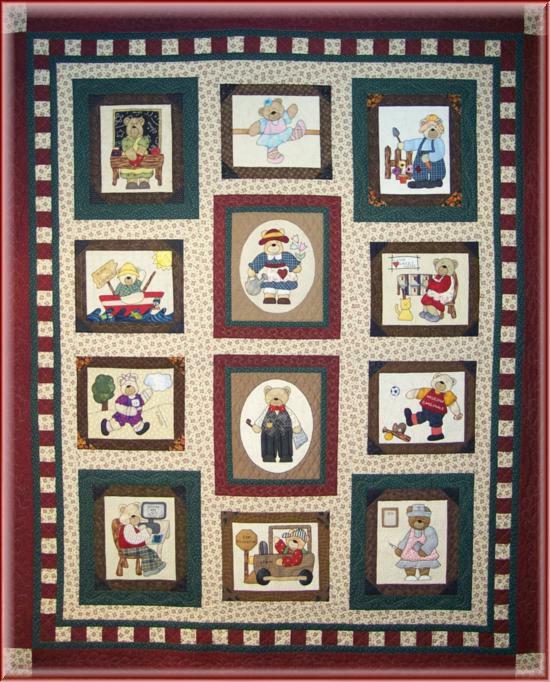 This BOM features Mama and Papa Bear in the center, surrounded by their ten children showing off their favorite occupations or hobbies. Mama and Papa will be so proud when you have completed this unique family album quilt! 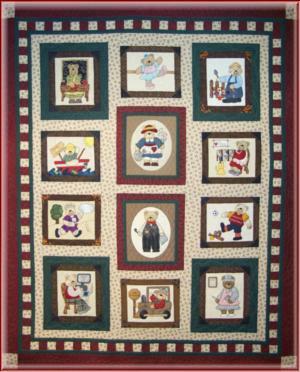 Shown in this quilt is Mama Bear, Papa Bear, Earl the Engineer, Gus the Gardener, Daisy the Dancer, Cornelius the Computer Tech, Rosie the Runner, Sam the Sports Enthusiast, Tessie the Teacher, Fred the Fisherman, Nora the Nurse, and Quilian the Quilter. This BOM can be fused & buttonhole-stitched or appliquéd, either way, you are sure to have fun! This quilt finishes out approximately 72" x 88". Pattern by Lynda Howell from The Stitch Connection. Each kit includes pattern, plus fabrics for each block.